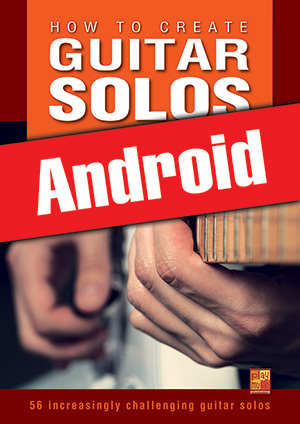 How to create guitar solos (Android) (GUITAR, Courses for Android, Danny Pierce). Learning to play scales and arpeggios and other people’s solos can be very interesting indeed, but learning to create a coherent, vibrant and impressive solo all on your own, which, in addition, fits the context perfectly, is much more exciting, and this is exactly what we strive for here. This coursebook will not simply teach you the necessary tools for melody writing (there are enough other courses available for this), but it will teach you the construction basics needed to build your own top-class guitar solos. The increasingly challenging pieces will be addressed in a simple and playful manner. For each of the 14 (4-, 8- and 12-bar) backing tracks you have a series of 4 different solos of varying difficulty at your disposal, bringing the total to 56. The solos within a series feature the same basic structure, which is melodically, rhythmically and technically upgraded from one solo to another. Put simply: The first solo is elementary and easily accessible, while the fourth is much more demanding. Yet this does not mean that only the fourth solo is perfectly structured. You may rest assured that every solo in this coursebook is genuine and worthy of its name, whatever its degree of difficulty! On the data disk (the mp3 audios and mp4 videos) attached to the coursebook you will find demonstration videos for every single one of the 56 solos (first at actual, then at a slower playing speed), as well as their corresponding extra long backing tracks that will allow you to fully unfold without fear or restraints. Since you are dealing here with the Android version of the tutorial, the book and the data disc have been replaced by a tablet-optimized multimedia pack containing musical sheets, texts, audios and videos. Take advantage of a 75% reduction on the other versions of this course! If you buy this course in its paper, PDF, iPad or Android version, you will get a 75% reduction on every other digital version of the same course. Act now!